Our trip to Flagstaff and the Grand Canyon was crazy! Our plan was to ski Snowbowl Arizona on Saturday and then visit the Grand Canyon Sunday before heading to Las Vegas. It turned out to be a fun, expensive and stressful weekend. We left our spot near Sedona late Friday afternoon and drove north to Flagstaff to stay at Black Bart's RV Park. It wasn't much of an RV park but it was close to Snowbowl and did have a super fun restaurant on the property. 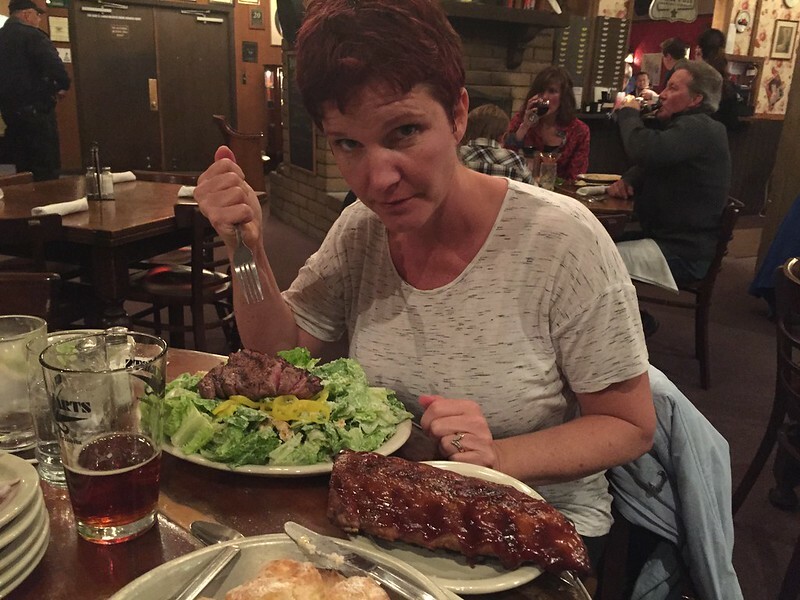 The Black Bart's Steakhouse, Saloon, & Musical Revue is a 35 year old steakhouse where the wait staff (music students from the local college) perform on stage in a Musical Revue, including songs from Broadway, Disney, 60s and 70s, and much more! It was so unexpected and so much fun! Check out the video. After dinner we walked back across the parking lot and worried about how cold it was becoming as the show was beginning to fall again. We quickly pulled the water hoses in and tried to keep the RV as warm as possible as we hit the sack. It was in the high teens with light flurries when we woke up in the morning. We were worried what might be frozen on our RV but there was no way to tell at that point. Besides, we had skiing to do!! 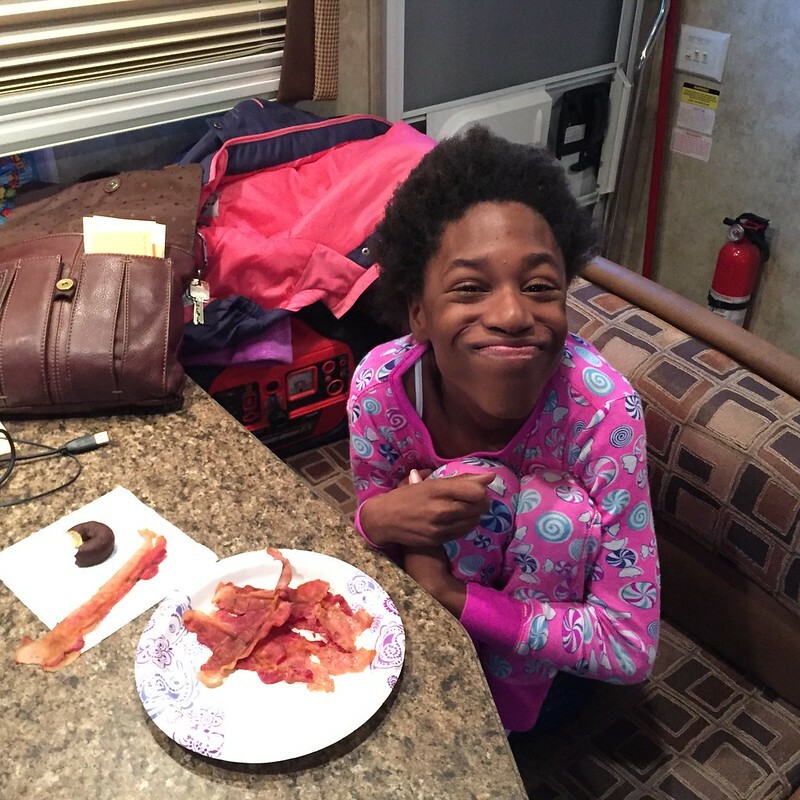 The kids had a hearty breakfast of donuts and bacon before we loaded everyone up and headed back to the mountain for a day of skiing. 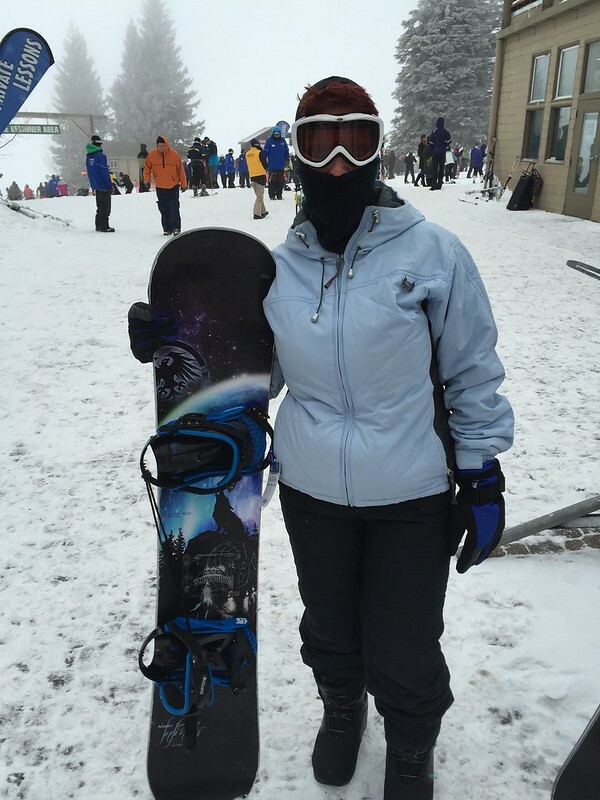 Again, we put the girls into ski school and Cathy and I took snowboarding lessons. I'd always wanted to learn but felt I needed to help Cathy and the kids out while skiing and I just felt more comfortable on skis. At the end of our lessons it was lunch time and Kira wasn't feeling well. Cathy called it quits for the day and sat with her in the lodge for the rest of the day while the rest of us ran the slopes. I spent the next couple of hours snowboarding by myself and getting pretty good if I do say so. Towards the end of the day I found Hali and we spent the last hour or so together. She was getting pretty good as well. We passed Lexi a couple of time in her class and she was coming along quite nicely. Everyone had a blast but was tired. When skiing was done for the day we quickly turned it our equipment and rushed down the mountain to our RV. 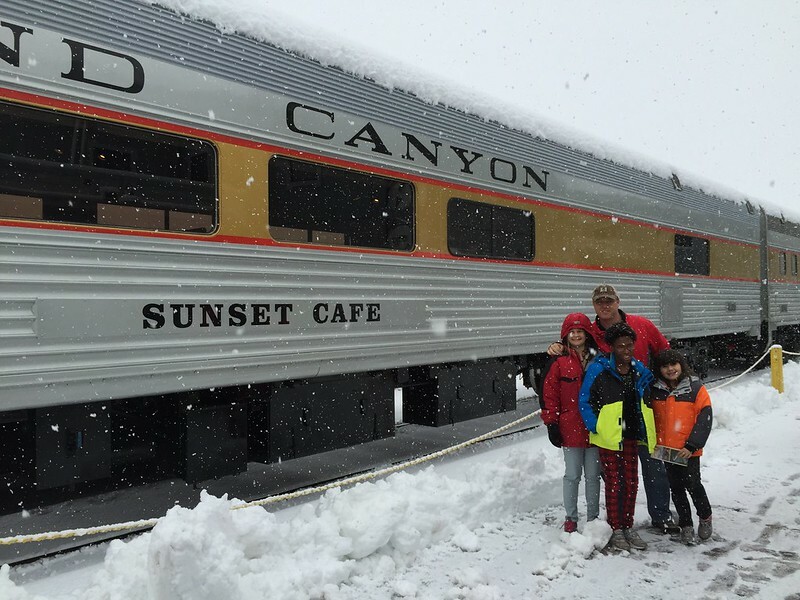 We stripped off our ski clothes, packed up the RV and took off a few minutes west to Williams, AZ to the Grand Canyon Railway Hotel. Cathy had booked us on a 4 hour round trip train ride to see the Grand Canyon. When we arrived at the hotel is was starting to snow again so I quickly picked up our train tickets and checked us into our room. 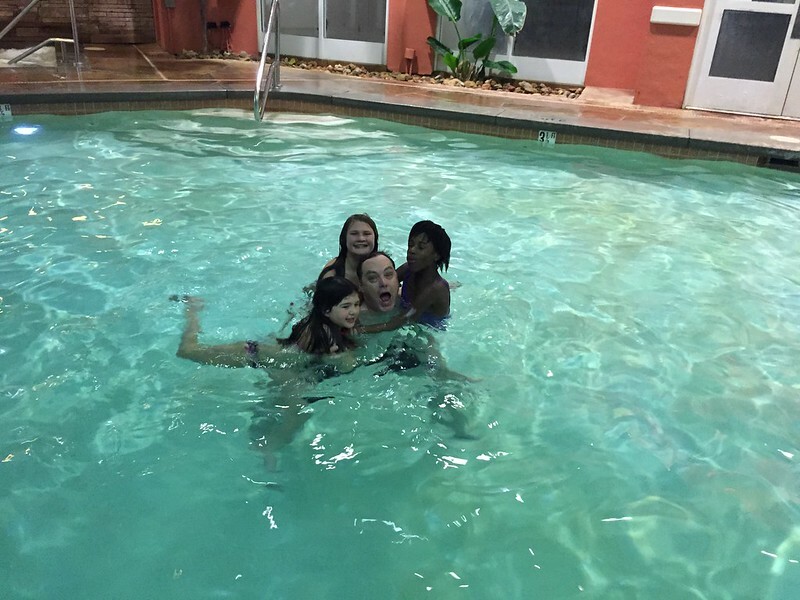 We decided to eat at the pub in the restaurant and then play a rousing game of "drown dad" in the pool. A lovely evening. The next morning we woke up early to 6-8 inches of snow. 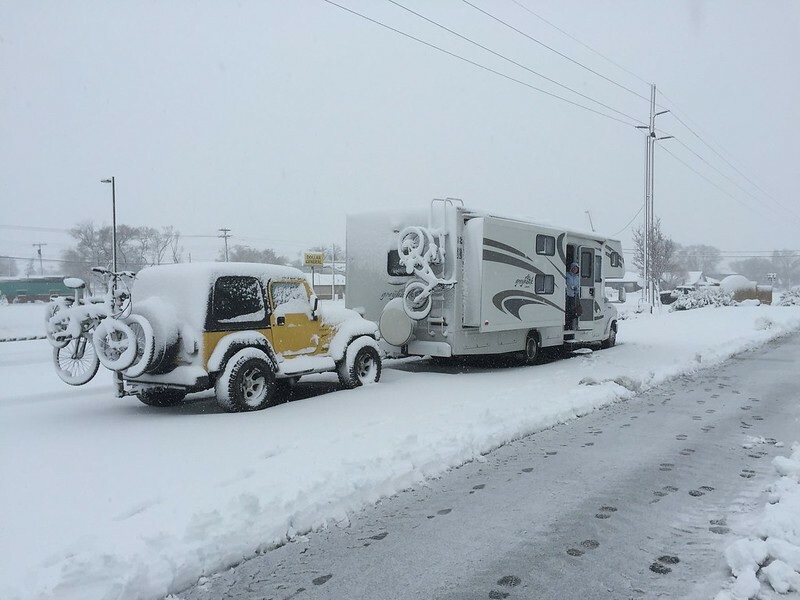 Our RV was buried and as cold as ice. Apparently we'd left one of the overhead lights on which drained the battery so much that the propane heater didn't kick on. Luckily the engine started right back up and within a few minutes the propane heater started thawing things out. Hopefully nothing was frozen as we'd drained everything the night before. We had the overpriced buffet breakfast next door and hopped on the train at 9:30am. It was a 2 hour ride to the Grand Canyon and it continued to snow. And snow. They do a great job of keeping everyone entertained during the trip with a steward for each car and some singing cowboys roaming from car to car. It continued to snow for the entire trip. 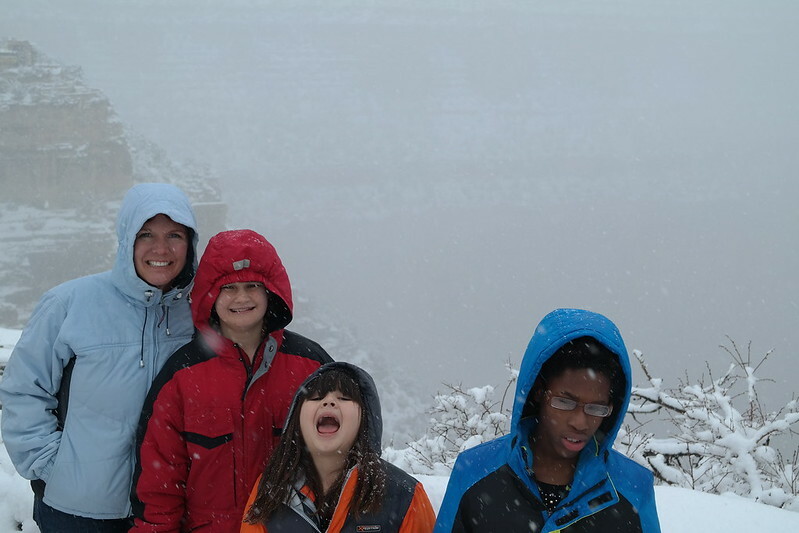 We arrived at the Grand Canyon and the snow was really coming down. You couldn't see more then maybe 100 yards ahead of you. It was total white-out. You couldn't see the Grand Canyou at all. We had to take an employee's word that there was a giant hole in front of us. So we essentially just walked around the edge of the Grand Canyon feeling sorry for ourselves and throwing snowballs at each other. A great way to blow $500! After lunch in the restaurant and blowing more money in the gift shops, everyone boarded the train and headed back to the hotel. The weather reports kept coming in that this was the worst winter storm they'd had all year and it was going to come down for days. We'd probably received 12 inches during the daytime and they were expecting 12-18 inches tomorrow. It was forecast to snow till Wednesday. However, the highways were clear! The weren't expecting more snow till later that night. We weren't sure if we should try and leave immediately for Las Vegas or wait the storm out for 2-3 days in the expensive hotel. We consulted the weather channel again and a couple of employees at the hotel and found out that once you make it about 10 miles west over the mountain pass it got considerable warmer. So we made bold (foolish?) decision to head out immediately. The roads were clear but but it was a little gusty and we didn't know if/when we'd hit a patch of black ice. It was some white-knuckle driving for 15-20 minutes until we finally started down the pass and we started to see less snow on the ground. We all took a deep breath. From then on the drive to Las Vegas was uneventful and we arrived RV park around 9pm or so. We had a nice little end spot in this really cool park and we hit the sack. Exhausted physically and mentally.